The 2nd international conference “Social Solidarity Economy & the Commons: Contributions for the deepening of Democracy” will be a meeting point for researchers, activists, public officials and social entrepreneurs involved with social and solidarity economy, governance of the Commons and new social movements in different parts of the world. The conference will take place from the 6th to the 8th of November 2019 at Instituto Universitário de Lisboa (ISCTE-IUL) in Lisbon, Portugal. The goal of this conference is to be an open and interdisciplinary space for exchange of knowledge and socio-political experiences on the deepening and widening of democracy and the promotion of social solidarity economy and the governance of the Commons in different parts of the world. 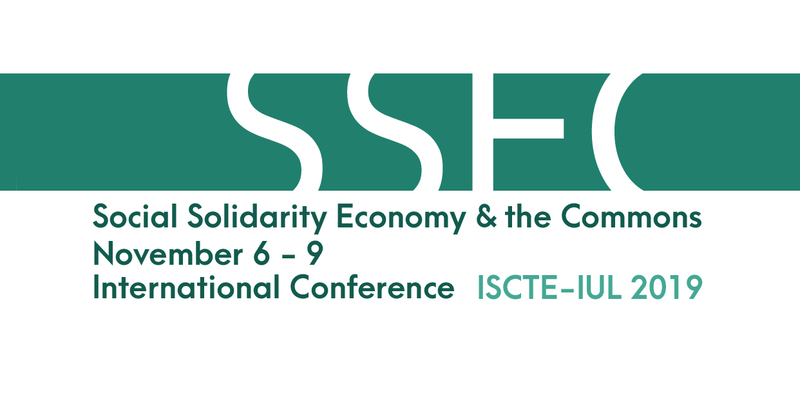 The conference is organized by the Centre for International Studies (CEI-IUL), with the support of the Department of Political Economy of ISCTE-IUL, the Centre for Ecology, Evolution and Environmental Changes (CE3C) of the School of Natural Sciences of the University of Lisbon and the Solidarity Economy Incubator of the Federal University of Alagoas (UFAL, Brazil). We are hereby launching the conference’s call for papers, posters and panels, which includes information about its organization, the topics addressed and cost of participation. We will send regular updates about its organization by e-mail and through the social media accounts of CEI-IUL (Facebook and Twitter). Any questions regarding the organization of the conference or participation can be sent to ssecommons.cei@iscte-iul.pt. In response to the contemporary political, economic, and environmental crisis, various social movements and government programs are developing alternatives to the socio-economic status quo and representative democracy by mobilizing endogenous practices and resources, as well as promoting synergies among grassroots civil society initiatives and progressive governments. Within these movements stands out Social Solidarity Economy and the Commons. This international and interdisciplinary conference aims to publicize and promote research on forms of participatory governance promoted by social movements and governments to overcome the challenges that communities, governments and organizations currently face by promoting Social Solidarity Economy and Commons-based strategies of governance. This year’s edition of the international conference “Social Solidarity Economy & Commons” focuses on conceptual and normative frameworks that support the development of cooperative and sustainable alternatives to neoliberal capitalism and strengthen civil society and the state through participatory democracy. We invite researchers, activists, public officials and social entrepreneurs to submit papers, posters and panel proposals based on research projects or concrete activist, economic or public policy initiatives. The topics include social movements, processes of knowledge production and diffusion, public policies and alternative strategies of economic governance based on Social Solidarity Economy, as well as the democratic and collective management of the Commons. We aim to promote an interdisciplinary perspective at the theoretical and methodological level, for which we invite academics and practitioners to debate these topics from the perspective of civil society organizations, enterprises and governments. The application of Social Solidarity Economy and Commons-based governance to adaptation to climate change, by promoting the transition to renewable energy, agroecology, sustainable water management, among other sustainable technologies. Paper, poster and panel proposals can be submitted in English, French, Portuguese or Spanish. However, the language of presentation shall be English. Proposals should have a maximum length of 800 words and indicate the thematic field of the conference they shall be included, as well as five keywords. The deadline for submission is May 31 2019. The email address for proposal submission is ssecommons.cei@iscte-iul.pt. After the conference, the organizing committee will launch a call for chapters of an edited, open-source volume of the collection of ebooks of the Centre for International Studies (CEI-IUL). All the authors who presented papers, posters and panels at the conference will be invited to develop their presentations into publishable manuscripts for peer-review. Obs: We will offer translation services (English/Portuguese) only during the opening, closing and keynote sessions.